NEI’s sales team is a highly specialized group of individuals who understand your company’s needs. Please take a minute to find the sales person in your area. Navigation Electronics, Inc. (NEI) was formed in 1984 as a division of John Chance & Assoc., performing instrument sales and service to the offshore oil and related industries. In 1988, Charlie Poche acquired NEI and began expanding its service to land, hydrographic, geodetic surveyors, as well as GIS & Mapping professionals. 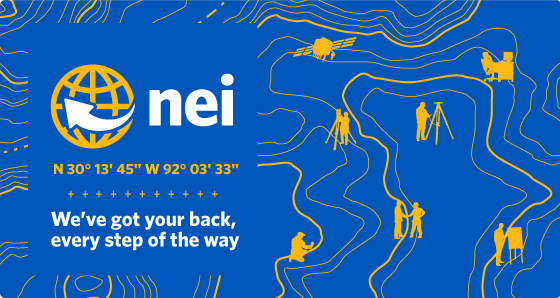 In 1989, NEI was one of the first Trimble GPS distributors and soon after, it grew to become one of the largest distributors of GPS surveying and mapping equipment. NEI is also an authorized ESRI and Spectra Precision /Nikon business partner, as well as LTI, Seco, Teledyne Odom, Seafloor Systems and Pacific Crest distributor. NEI’s corporate headquarters is located in Lafayette, LA with satellite offices in Georgia, Louisiana, Mississippi, Tennessee, Alabama, Florida and Arkansas. NEI maintains their service center and sales office at their headquarters in Lafayette, LA, and a sales office & GIS training center in Duluth, GA. NEI is a women-owned and operated business, with Barbara Poche serving as President & CEO. Want to work for the Southeast’s leading Trimble dealer and focus on delivering total customer satisfaction? Here’s your chance!